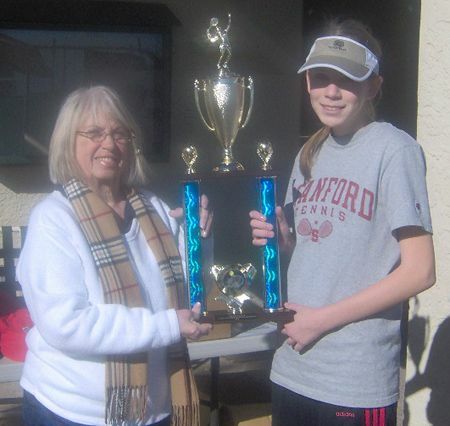 The USTA Central Arizona Junior Satellite Grand Masters was held the weekend of December 1st at Kiwanis Recreation Center in Tempe, Arizona. The Junior Satellites are a year-round series of tournaments held at varying sites throughout the Valley, for players just starting their tournament experience. Each December the year's finale is held, as an invitational tournament, rewarding the players for their effort. Lunch is provided to entrants and their families on Saturday, and this year each player received a USTA cap. The following pictures are of the High Points Champion, both male and female. Each is awarded the trophy for accumulating points during the Satellite season, which runs from January to November. The girls champion is Chelsea Ellis, being presented the trophy by Ruth Schoffner. 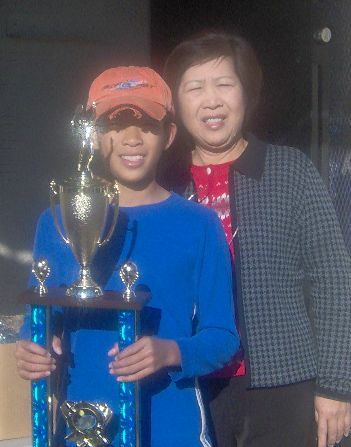 The boys trophy is to Jason Jaruvang, being presented by Jason's mother, Ona Jaruvang.